Housing for seniors 62 or older or disabled 18 or older. All units at this property offer project based subsidy through HUD Section 8 program. Tenants must qualify and will only pay 30% of their income for rent. 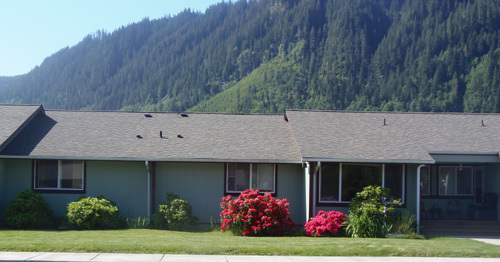 Tilton River Court is nestled in a serene setting in Morton, Washington. We're close to banking, grocery store, and Post Office. If you need to venture out a little further Mountain View Transit is just a phone call away! Sewer, water, garbage included in rent and we pay for the electricity too! Subsidized apartments may be available at this time, if no apartments are available applicants may be placed on a waiting list. PLUS Tilton River Applicants pay no screening fees! Stop in and take a tour today! Income Limit Details: Below HUD very low income limit with preference for extremely very low. Rent includes electric, water, sewer, and garbage. All units at this property offer project based subsidy through HUD Section 8 program. Tenants must qualify and will only pay 30% of their income for rent.